England's triumph at the 2010 World Twenty20 in the Caribbean was enough to cause even the most optimistic members of the Barmy Army to splutter into their rum punches. After all, they had never won a global one-day tournament, had been knocked out of the previous two World Twenty20s in the last eight and arrived at the event having lost six of their previous 10 games in the sport's shortest format. All that was to change in the West Indies, however, as England recovered from a stuttering start in a rain-ravaged group stage, powered past Pakistan,South Africa and New Zealand in the Super Eights and trounced Sri Lanka in the semi-finals. Old foes Australia were expected to provide a stern test in the final with their four-pronged pace attack on a hard Barbados track, but blistering knocks from Craig Kieswetter and Kevin Pietersen helped England romp home with three overs to spare. Victorious captain Paul Collingwood describes the all-night Barbados boogie that followed as "very special indeed" as England feted their unlikely victory. Here, he reveals the secrets behind their success. Fundamental to England's triumph was the 11th-hour discovery of opening partners Kieswetter and Michael Lumb. The untried duo were parachuted in from the England Lions after totally outshining first-choice Twenty20 openers Jonathan Trott and Joe Denly in a February friendly in Abu Dhabi. After Denly had fallen for four and Trott for a pedestrian 24, Kieswetter smashed 81 off 66 balls and Lumb an unbeaten 58 off 35 as the understudies stole the show. When Trott and Denly continued to struggle in the two matches against Pakistan that followed, the selectors' minds were made up and Kieswetter and Lumb were brought in to make their Twenty20 debuts at the tournament. It proved a crucial decision as the left-hand/right-hand pair consistently kick-started England's innings, putting on partnerships of at least 24 in five of the seven matches and 68 in the semi-final win over Sri Lanka. Kieswetter, in particular, was a revelation, striking 11 sixes - the second highest by a batsman in the tournament - and finishing as the fourth highest run-scorer on 222. "In the past we probably didn't have that real X-factor with our batting but Kieswetter and Lumb were amazing," recalls Collingwood. "They smashed our bowlers all over the place in Abu Dhabi and we thought 'we have to get these two guys in the team'. "They hadn't played for us before and they were put straight in to a World Cup, but we saw the potential there, thought it was a risk worth taking and it paid off." If Kieswetter, Lumb and an in-form Pietersen were the cornerstones of some imposing batting displays, England's disciplined performances with the ball were equally important. After noting that seven of the top 10 bowlers in that season's Indian Premier League were left-arm seamers, Collingwood and team director Andy Flower chose veteran Ryan Sidebottom ahead of Test favourite James Anderson to spearhead the attack. The decision paid off in style as Sidebottom proved a potent force at the beginning and end of each innings, finishing off South Africa with three late wickets in the Super Eights and snaring two early Australia wickets to set England on the road to victory in the final. "It was a little theory of mine that especially against right-handers, a left-arm seamer's cutters tended to go across them and were harder to hit," says Collingwood. "I felt that Ryan could be crucial to us and so it proved as he did a fantastic job. I was mainly using him as a death bowler but those early wickets in the final were huge." Sidebottom was part of a clinical England unit that prevented any of their opponents from posting a total higher than 149. Tim Bresnan and Stuart Broad combined pace and guile, Graeme Swann took several key wickets with his attacking brand of off-spin and Michael Yardy put the squeeze on in the middle overs with his awkward, flat left-arm deliveries. "I always think bowlers win you World Cups," says Collingwood. "They prepared for every single batsman and the way they executed their plans was phenomenal. "The seamers bowled a heavy straight length early on, then mixed it up with slower ball bouncers and yorkers. "They bowled well as a unit and the spinners deserve a lot of credit too. Nobody really got on top of Swann or Yardy and took them down. They were a really good combination." One of the explanations often given for England's sterile displays at the 2010 football World Cup is the stifling atmosphere at their isolated training base in South Africa. Broad (Nottinghamshire), Bairstow (Yorkshire), Bopara (Essex), Bresnan (Yorkshire), Briggs (Hampshire), Buttler (Somerset), Dernbach (Surrey), Finn (Middlesex), Hales (Nottinghamshire), Kieswetter (Somerset), Lumb, Nottinghamshire), Morgan (Middlesex), Patel (Nottinghamshire), Swann (Nottinghamshire), Wright (Sussex). By the same token, England's uninhibited performances at the World Twenty20 may well have been a reflection of a much more contented camp. "All the guys were so relaxed through the tournament," remembers Collingwood. "It's an intense tournament, so you have to recharge your batteries inbetween games, playing golf, swimming in the pool and that kind of thing. The fun element of playing in the tournament really helped us. "We trained hard, but a lot of the training was confidence-building stuff. You watch footage of yourself hitting balls into the stands and then you go out and practise smashing it over the ropes. "We made that compulsory for all the players. It was fun and you come off feeling good about yourself." Will England miss Kevin Pietersen? England's team for their title defence features several survivors of their 2010 campaign, with Kieswetter, Eoin Morgan, Swann and captain Broad all certain to start Friday's opener against Afghanistan, and Lumb, Luke Wright, Ravi Bopara and Tim Bresnan all waiting in the wings. There is, of course, a Pietersen-sized hole in the batting line-up - after he was left out of the England squad for the World Twenty20 - but Collingwood is backing big-hitting youngsters Jonny Bairstow and Jos Buttler to fill the void left by the 2010 player of the tournament. "People will say Pietersen will be a huge loss but I think we have other guys who can fill his boots," he adds. "Look at Eoin Morgan and the experience he has in IPL, the way he finishes games. Kieswetter, Lumb and Luke Wright all have better skills than they had two years ago, while Bairstow and Buttler have been practising Twenty20 cricket from a very early age. "Unlike me, they can hit the ball 360 degrees with a lot of power. If you look at our batting, it's incredible how much power and unorthodoxy it has. I don't think we'll miss KP as much as people might think." 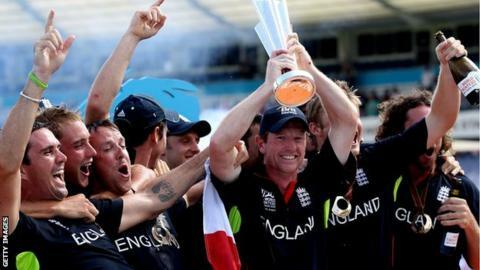 Read more on Has Twenty20 changed cricket?